providing luxury transportation with Mercedes S Class, Lincoln Continental and Mercedes Sprinter.
. Our dedicated team of professionals is equipped to not only satisfy the expectations of our clients but also exceed them. Anytime you need limo services in Chicago, be sure to give I-CLS a call! is one of the few fully legal on-demand transportation APPs on the market. While we provide outstanding service with some of the best vehicles on the planet, we still comply with the local regulations and safety standards. Our luxury chauffeur limo service APP never ceases to leave clients satisfied. services will pick you up and take you where you need to go in style every time. The Certified Professional Chauffeur, will always update the trip status, will be waiting for you at your location on time, will not charge your credit card in the vehicle, while ensuring that you get to your chosen destination without any stress. If needed, we can also arrange transportation services in other U.S. cities and Worldwide, through partnerships with high quality providers across the world. Our clients range from individuals and private organizations to large, globally based corporations. We have also served prominent politicians and dignitaries. Each and every one of our customers is ensured unlimited, loyal attention with a firm commitment towards quality service. A Chicago limo experience is more than just taking you from Point A to Point B. We work hard to achieve 100% customer satisfaction from our clients, ensuring maximum comfort for the entire duration of your trip.
. Anytime you need limo services in Chicago, be sure to use the I-CLS APP. Inter-Continental limo Chicago takes you on the ultimate luxury ride throughout iconic Chicago with the new IRIZAR I6 motor coach. 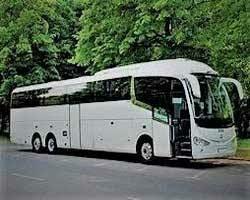 Top luxury Charter Bus company in Chicago offers corporate travel services at a whole new level. Once again, Inter-Continental Limo Services has raised the benchmark in the luxury corporate travel segment, with over 10 innovations in service reservations, passenger and driver comfort, safety and environmental efficiencies. 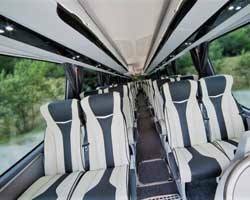 Experience the new motor coach bus at Inter-Continental Limo Services, the leader in corporate Coach Bus travel services in Chicago. MOVING EXECUTIVES WITH EXCELLENCE !
. Anytime you need limo services or charter bus travel in Chicago, be sure to use the I-CLS Smartphone APP for COACH BUS.